Blowout Sale! 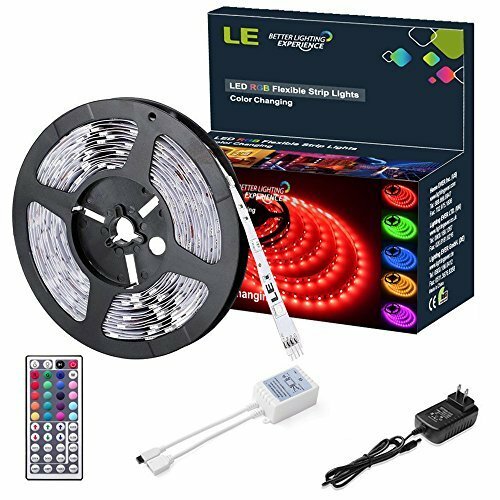 Save 58% on the LE 12V Flexible RGB LED Light Strip Kit, Color Changing, 150 Units 5050 LEDs, Non-Waterproof, Remote Controller and Power Adaptor Included, LED Tape, Pack of 16.4ft/5m by Lighting EVER at F LED Lights. MPN: 4100053-US-a. Hurry! Limited time offer. Offer valid only while supplies last. Ultimate customized mode. 16 colors with 6 DIY keys - 44 keys infrared controller which has 6 DIY keys for memorizing the colors that you preferred. For more connectors and connector cable, please search "Lighting EVER 5000071". Now click "Add to Cart" to get your indoor decoration solution!